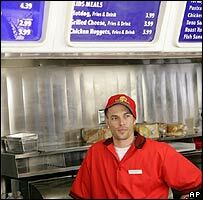 A US advert starring Britney Spears' estranged husband, Kevin Federline, has angered a fast food trade group. The 28-year-old pokes fun at his stalled music career as he daydreams of hitting the big time while serving French fries at a takeaway. The National Restaurant Association says the advert suggests restaurant work is "demeaning and unpleasant". But advertiser Nationwide Mutual Insurance insists Federline is the only one being mocked. The commercial will be shown on 4 February during the Super Bowl - US TV's highest-rated broadcast, commanding the highest fees for advertising. Rapper Federline, also known as K-Fed, launched his music career amid a blaze of publicity but only sold 6,500 copies of his debut album, Playing with Fire, in the first week of its release. The backing dancer-turned-musician split from Spears in November after two years of marriage. Court papers filed in November revealed he plans to fight the pop star for sole custody of their two children.